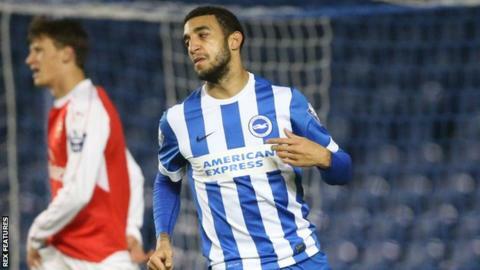 Police are investigating allegations of racial abuse directed at Brighton defender Connor Goldson during Saturday's 2-2 draw at Derby County. Goldson, 22, was not in the squad for the Championship match, but was watching in the iPro Stadium stands. Derby County said they were "concerned" and Brighton said the alleged incident was "totally unacceptable". Brighton goalkeeper David Stockdale tweeted that one of his team-mates had been racially abused. "Disgusted that a Derby fan today racially abused one of our players," he wrote. "No place in the world should any person have to take that!" Both teams have reported the incident to the police. PC Darren Balkham, Sussex Police's football intelligence and liaison officer for Brighton, said he would speak to Goldson about the incident. He replied to Stockdale's tweet, saying: "I am aware of this incident having been contacted post match. "I will liaise with colleagues from Derbyshire police."